less happening village of Kanyapuram, an aspiring author loses a copy of her very first manuscript. The Inimitable Chaos of Life – A perfect book to stir out the emotions from the depth of your heart. 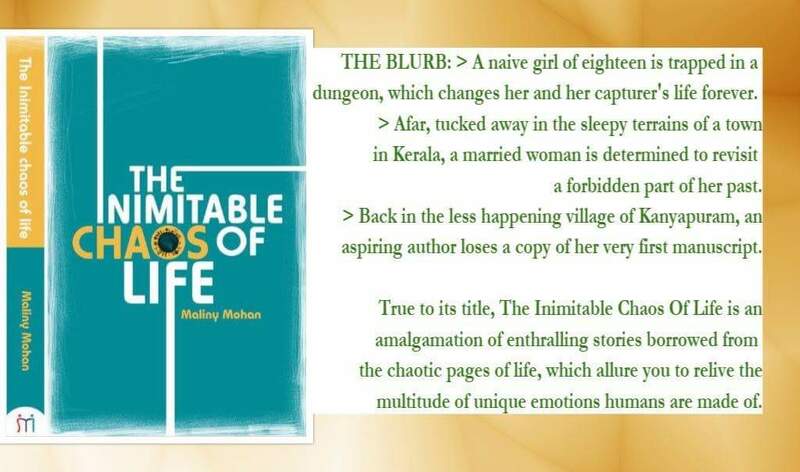 This book is a combination of 14 different short stories which has the capability to leave an impact in the reader’s heart in one way or other. The author has narrated every stories with utmost care and so it helps us to maintain coherence with the book. Overall, this book is an amalgamation of struggles, chaos, pain, heartbreak, betrayal, love etc. Though every stories possess a different storyline, they all grabs the reader’s attention within finishing a single page. And so it makes the book, an immediate page turner. Some stories also left me with tears since they depict the reality about the daily chaos which everyone undergoes in their life. And some will be forever close to my heart. Sara – the story about the siblinghood of two orphans Sara and Thomas. This story will teach you about love – the love which never ends. I ended up with tears after reading this story. A soulful chapter-Sonu – It deals with the bonding between a maid’s son and his owner who adopts him when life pushes him into tragedy. Fortitude – This deals with the story of Seema, who ends up in jail after fighting against the injustice done to her sister. And every story will leave you with a refreshment and a deep impact. The another best part of the book is its language which grips the readers to the book. The author has very well weaved the plot of the book and teaches us the importance of relations, feelings, emotions and etc.. in our life. The words are very well knitted and helps to add some more words to our vocabulary. The cover is simple with an intriguing title which gives us a clue on the content of the book. One of the wonderful books on reality which should not be missed.